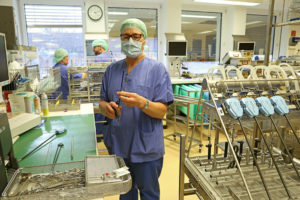 Around 50.000 reusable medical instruments are in circulation in the surgical departments at Universitätsklinikum Erlangen: scissors, tweezers, clamps, special instruments and highly sensitive operating arms for the surgical robot Da Vinci. They all come into contact with blood, other bodily fluids, and different bacteria while being used. They must be sterilised for the next operation, and this is ensured through meticulous reprocessing. It takes at least four hours before an instrument can be used for surgery. This is the amount of time required for dismantling, cleaning, disinfection, checking, maintenance, packaging and sterilisation. Each individual step is recorded exactly using an electronic documentation system. This makes it possible to trace who held the instrument used for a particular patient in their hands and how the sterilisation process was carried out even 15 years after the operation. The main part of the reprocessing procedure takes place in the central sterile services department (CSSD) on the third floor of the Department of Surgery, just a few steps away from the main operating theatre. However, each instrument passes through several stations on the way from the operating theatre to the CSSD and back again. In the afternoon you can hardly move in the decontamination zone. Many trolleys with used instruments are waiting to be processed. 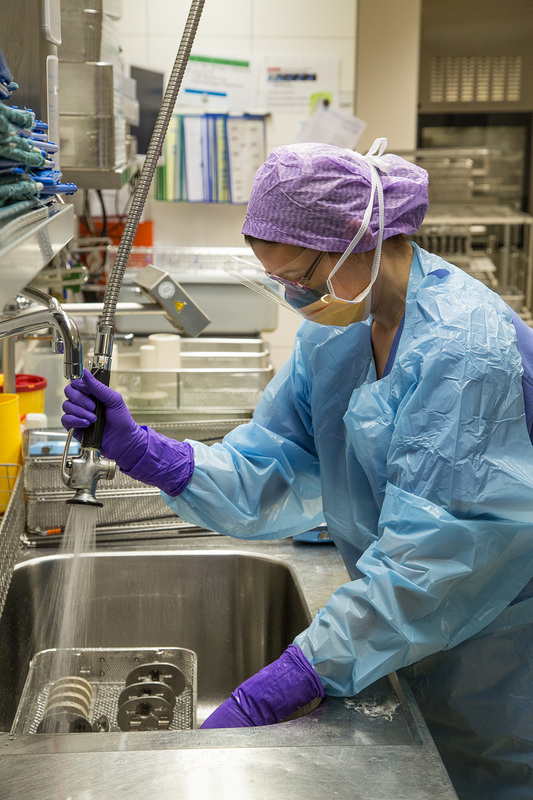 First, two members of staff pre-clean the instruments with water or ultrasound and sort them into special racks for the cleaning and disinfection units. They scan and register each set of instruments using a barcode which is linked to the instructions for use and the cleaning instructions. The cleaning units have special programmes for particularly sensitive or contaminated instruments. A cycle lasts around an hour and the water is heated to 95 degrees during the main wash. The CSSD uses a two-stage cleaning process with two cycles. This is expensive but particularly safe. Apart from their glass doors, the cleaning and disinfection units do not look much different to a standard dishwasher, but the technology that they use is much more advanced. The machines register down to the most minute detail whether all requirements are met. If, for example, the water pressure or the temperature fluctuates, or one of the spray arms spins too slowly or too fast, the machine stops the cleaning programme immediately and reports an error. In such cases the cleaning process has to be started again from the beginning. Another unique feature of the cleaning units is their pass-through design. They have doors on two sides that cannot be opened at the same time. The staff in the decontamination zone load the machines in the unclean area; their colleagues in the packing area take over after the cleaning cycle has finished. Here the instruments are taken out of the machines and sorted into complete sets for operations. The staff check again that the instruments are clean, check that they work properly and treat them with oil. They also scan the barcodes again, registering themselves as the ‘packer’. This connects them electronically in the documentation system with the particular set of instruments for the next 15 years. In the next stage of the process the instruments are either shrink-wrapped individually or packed into special containers. 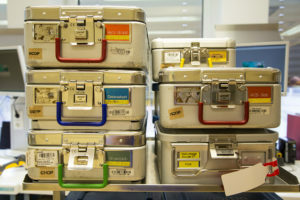 A sticker is then placed on them which contains all the data relating to the reprocessing and is later stuck into the patient’s file during the operation. 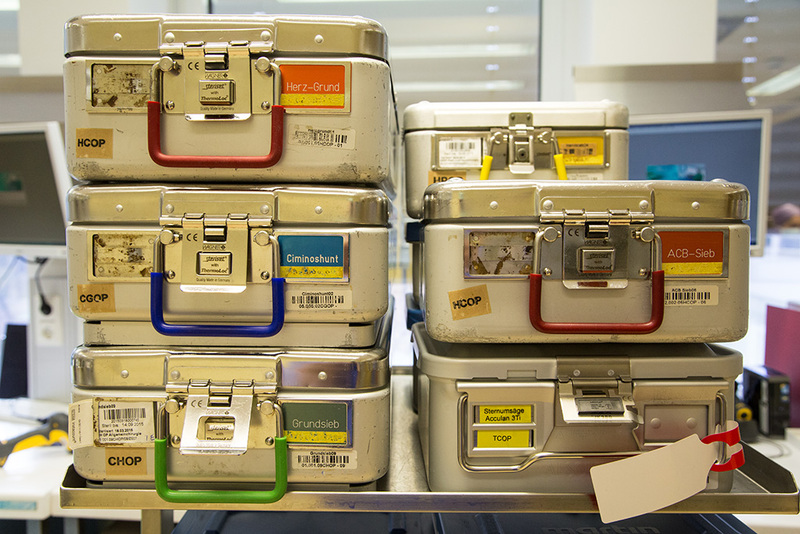 However, before the instruments can be taken to the operating theatre there is one more important step: the containers and individual packs are sterilised in the steriliser at 134 degrees. This data is also registered electronically and stored centrally. The system that the CSSD uses is incredibly sophisticated. Like the cleaning units, the sterilisers can be opened from two sides. Once the programme has finished the staff in the sterile area check the process data, make sure that each container and pack is undamaged and register them again. 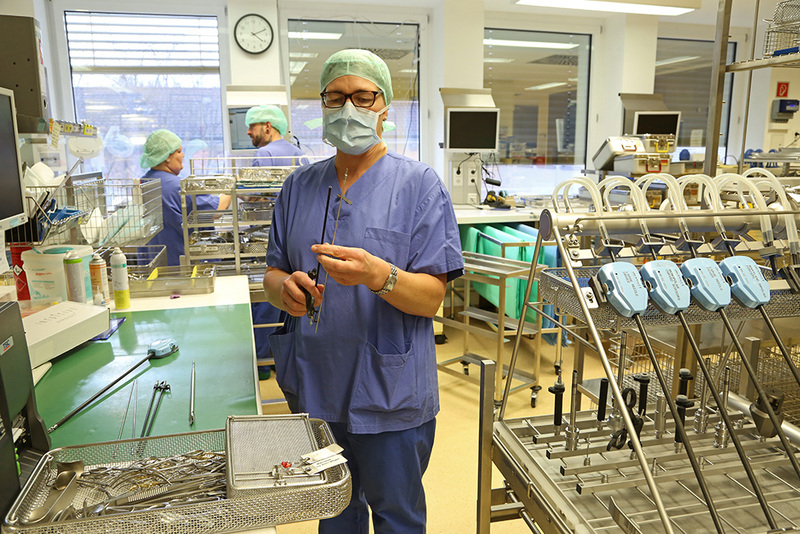 The instruments used in the main operating theatre are stored in one of the 65 cupboards in the sterile store room which is located between the CSSD and the main operating theatre. The instruments for the other departments are put in closed transports trolleys in the trolley station, sorted according to where they are to be used, and are collected from there. They are then ready for the next operation. Before the patient is brought into the operating theatre the surgical nurses prepare the instruments for the operation. 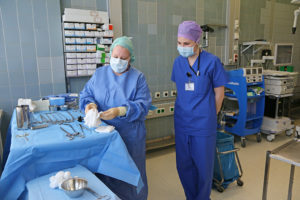 Two nurses count all of the instruments and textiles, such as compresses or lap sponges, that are needed for the operation and lay them out ready. As they do so, the nurses check again that all the packaging is sealed and undamaged. This ensures that everything is sterile. After the operation all of the instruments and textiles are counted again, and it is only once the surgical nurses have confirmed that everything is accounted for that the surgeon begins closing the wound. The cycle then starts again from the beginning for the instruments. 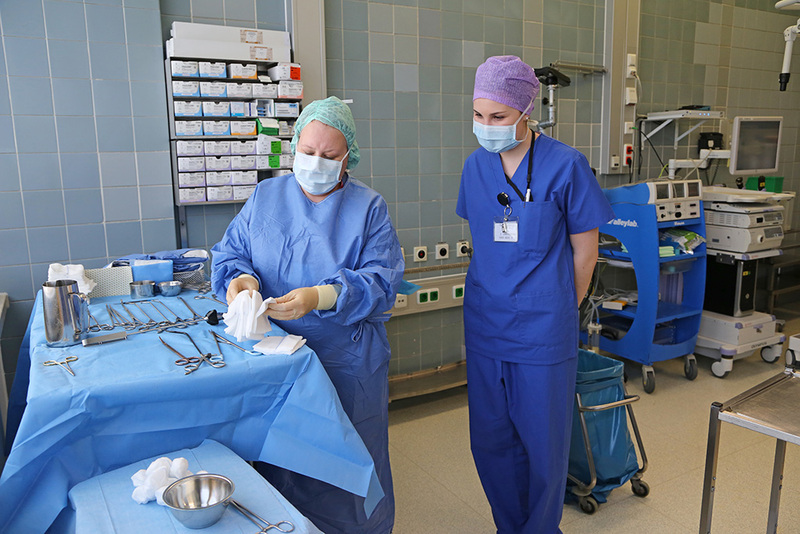 27 members of staff work at the CSSD at Universitätsklinikum Erlangen’s Department of Surgery with two shifts each day. The department operates 365 days a year and produces around 750 sets, individual packs and containers each day, some of which contain many small individual parts. Each stage of the reprocessing is regulated by a norm, guideline or DIN standard. It is an area that is subject to many close checks, but that is how it should be, as the CSSD contributes to safe patient care. There are many interesting places at FAU. We will introduce you to them in regular articles in alexander. 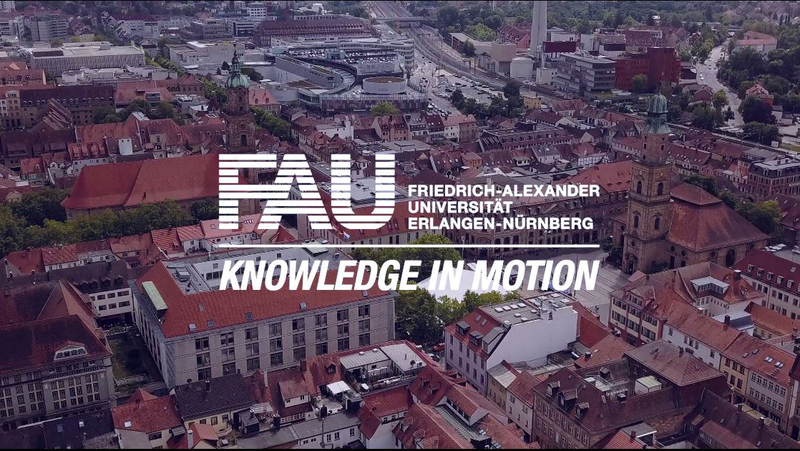 You can also find the articles all in one place in our blog Interesting places at FAU.